I just wanted to let you know that we will be releasing a version of Nbody tomorrow. I will be more specific on the changes that have been made after releasing. However, this version should hopefully be much faster and fix some other bugs. Message 63529 - Posted: 5 May 2015, 19:46:01 UTC - in response to Message 63520. This latest nbody is not using multiple CPUs as expected. 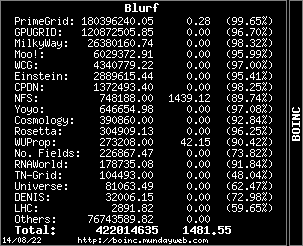 It tells BOINC it's using 7 CPUs, but Windows task manager clearly shows it using only one CPU. Message 63547 - Posted: 10 May 2015, 6:49:25 UTC - in response to Message 63529. Same issue here ... It is using ONE CPU, (says 4) but also seems to be prohibiting work on the others. The WU has been running for well over 8 hours, even though the progress is showing 100%. May end up aborting this unit. I deleted one that ran for nearly 8 hours. 1 ran for 15 hours, another for 9, third one I aborted after 2. same issue as others reported. At the same time BOINC Manager won't let any other WUs run because all teh CPUs are:"in use"